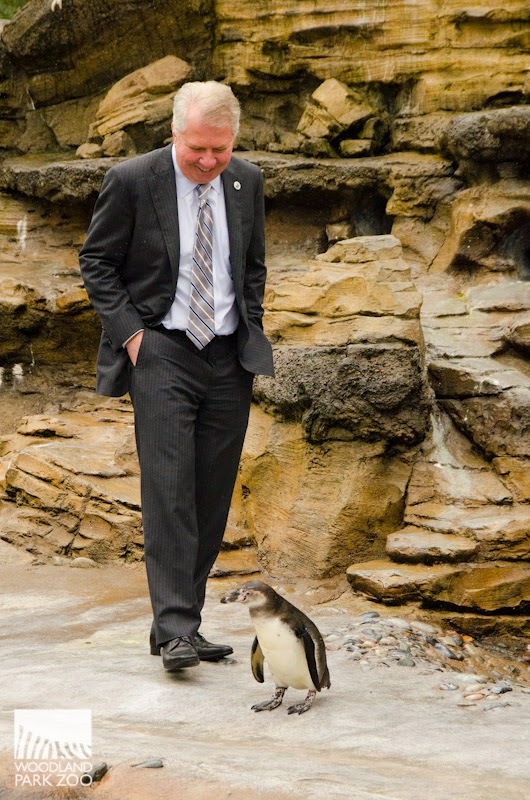 A suited Mayor Murray greets a tuxedoed penguin. Photo by Ryan Hawk/WPZ. We had a very special guest at the zoo this morning, our very own Mayor of Seattle, Ed Murray! 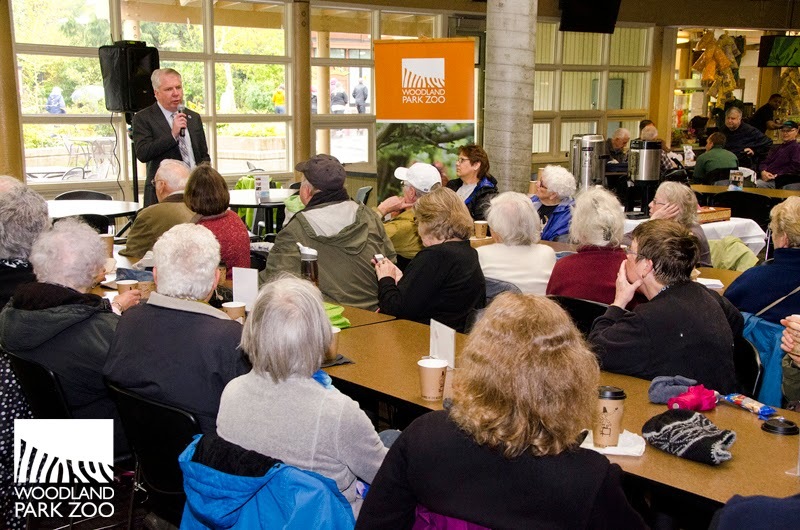 Senior Zoo Walkers enjoy a Q&A with Mayor Murray at the zoo. Photo by Ryan Hawk/WPZ. 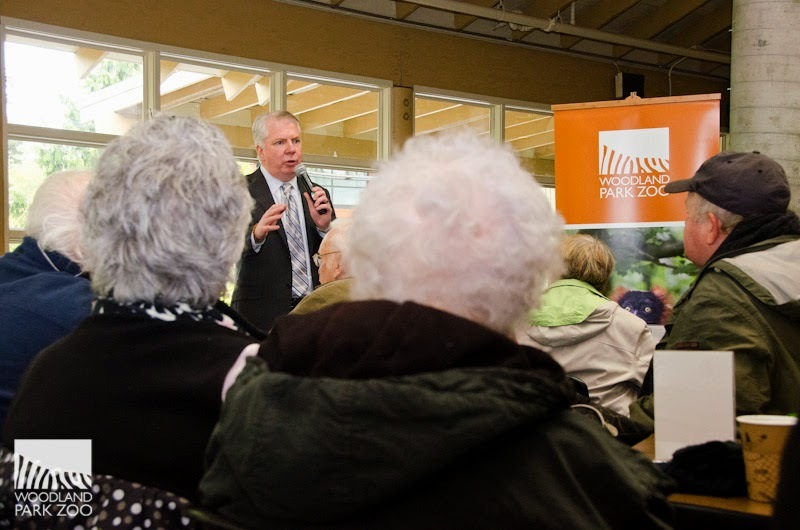 As they wrapped up this morning’s stroll around zoo grounds, the Senior Zoo Walkers—who participate in a joint Seattle parks and zoo senior health program—were joined by Seattle Mayor Ed Murray for conversation and a cup of coffee. After a welcome by zoo President and CEO, Deborah Jensen, Mayor Murray addressed several of the walkers’ questions and concerns about our city, including traffic and bicycle safety, and funding for the city’s parks and the zoo. Coffee and conversation at the zoo. Photo by Ryan Hawk/WPZ. The Mayor acknowledged that many necessary infrastructure projects at the zoo, local parks and community centers have gone unfunded and incomplete. He expressed his support for a park district and funding package to support these major maintenance requirements, which are currently under review by the city council. After speaking to the walkers, the Mayor had the rare chance to meet the zoo’s newest addition, a Humboldt penguin chick. Who can resist a four-day-old penguin chick? Certainly not Mayor Murray! The Mayor feels the downy feather coating of a newly hatched chick. Photo by Ryan Hawk/WPZ. The rest of the colony then waddled up to greet the Mayor with open flippers! Black and white dress code, tie optional. Photo by Ryan Hawk/WPZ. Zookeeper John Samaras provided an up-close briefing on these endangered species among the rookery. 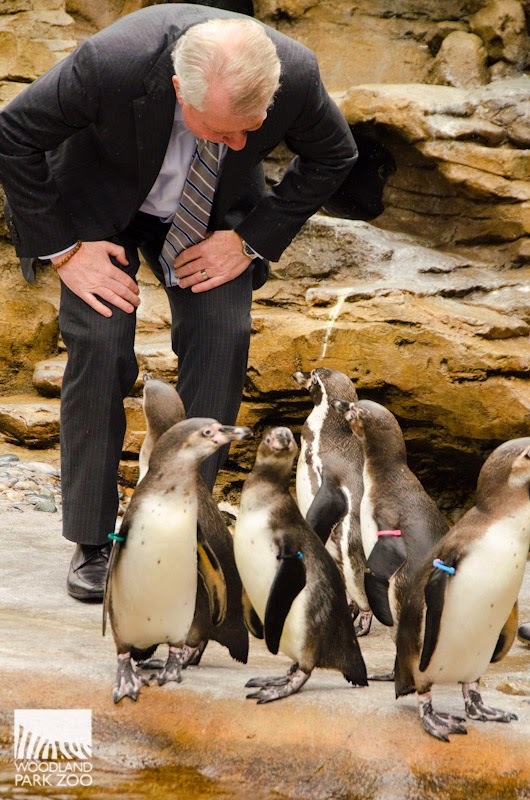 The Mayor then had some grueling penguin feeding training, a task our penguins were glad to participate in. Looks like he’s the right man for the job! 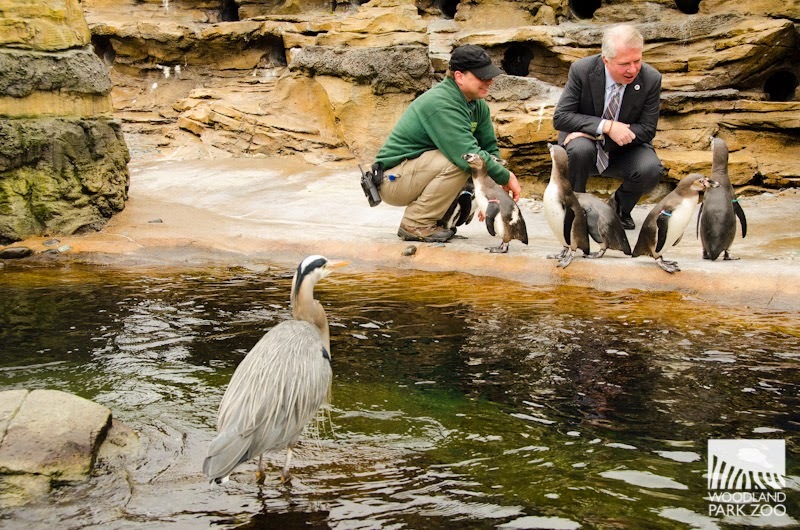 Even the heron is impressed with the Mayor’s penguin feeding skills. Photo by Ryan Hawk/WPZ. Thanks for stopping by #SeaMayor Murray—we hope you don’t smell too much like herring! 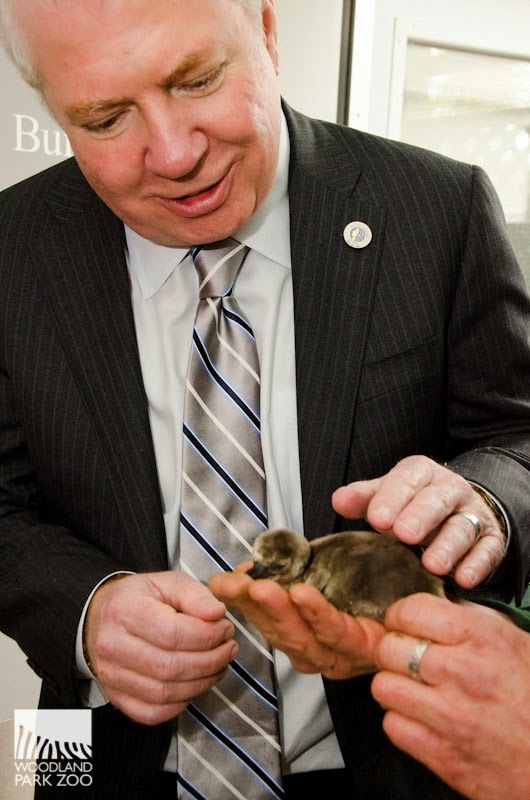 I need to get elected Mayor so they'll let me pet the penguin chicks! shout out to the Great Blue Heron! Eager froglets hatched ready for leaping! Thank you Woodland Park Zoo Volunteers! You created more wonder and more wild. Thank you! Seniors go in like a lion!